2 a: dependence on something future or contingent: hope. Each time I sit down here, in front of a white screen, pondering the arrangement of letters my fingers are forming, it is a meeting. Girl meets God. It’s not the only time we meet, of course–just a special time when the rest of the world gets a peek into our conversation. These days, that conversation has been a negotiation of trust, more than anything else. “Trust is not hard for those who can remember.” I can’t remember where or when I heard those words, but they stuck. It’s true, I thought. When I remember His faithfulness, trust is simple, easy, like the faith of a child. 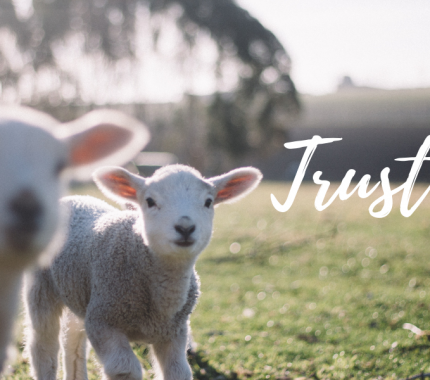 What does it mean to trust? It’s not just knowledge. It’s an assured reliance. What am I relying on? The character, ability, strength (and) truth. Of whom? Yahweh, the King of kings and Lord of lords. Trust is not a one-and-done choice. It does have that monumental choice…a beginning. But the first choice is only just that: a beginning. A beginning of what? The beginning of a relationship. Trust is a relationship. Relationships are not built on head-knowledge, or intellectual confidence. Relationships are formed from the messy organic parts of our lives, full of living heart. Tell me, if a heart stops beating, even for a moment, does the body remain stable? If the heart’s unending rhythm of pumping lifeblood out and pulling it back in ceases, can life continue? So too, when trust dwindles, the relationship suffers. It doesn’t necessarily die immediately, but…it’s broken. It suffers a wound. I am a flawed human, a victim of the Fall, yet complicit in it. I wound relationships far too often. I cannot keep the lifeblood pumping properly in my own strength. And also, I am wounded. I suffer heartache from the humans who deal wounds to me. Our relationships, though we so long for them to be perfect and overflowing with happiness, are broken. And as members in these broken relationships, we too are broken. But. There is a Redeemer. Shall I shout it? THERE IS A REDEEMER! One who buys us back from the curse in which we are entangled. He is a binder of the broken, a shelter for the weak. A mender of all that is in disrepair. A hope-giver who brings healing beyond what we could ever dream of accomplishing with our own dirty hands. He never inflicts a wound to our relationship with Him, no matter the countless scores of injuries we cause. He is always there, willing to accept us back home. Willing to build restoration, freely. And best of all, He doesn’t just wait: He chases us down. He knew we would never have come to Him first, so He sent His Son. To come. To live among us. To touch our broken places, and make us new. To heal our aching bodies, but more importantly, to renew our spirits, and give us the freedom to choose Him. To choose trust, when all we have known is those who cannot be perfectly worthy of it. And what does it look like, to trust Him? How can I know, how can others see, that I am living that assured reliance? It’s a portrait of surrender. Saying yes to His will, sight unseen, and then living like it’s a done deal. Because it is. It’s daily choosing to set aside worries and fears, instead seeking opportunities to further His glory, right where He has placed me. It’s loving others as He has loved me: while I was yet a sinner, and utterly unlovable. It’s being a minister of reconciliation, building bridges of hope and forgiveness, when all the world cries “it’s unmendable.” It’s living with a heart of gratitude, and proclaiming joy in the midst of the trials that are difficult far beyond what you thought you would ever have to bear. All in all, trust is confidence, and hope in the One who has proven Himself to be eternally faithful.